On the 13th December 2014, the Food Information for Consumers Regulation (EU FIC) will come into force bringing with them a wave of food labelling changes. 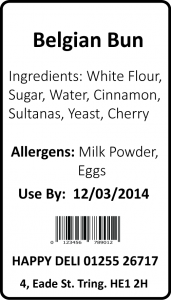 It is required that all allergen information is emphasised on the labelling. Any of the 14 allergens outlined in the regulations need to be emphasised on the labelling if they are present in the food. The allergens need to be clearly distinguished from the rest of the list of the ingredients. Therefore, you will need new labels for all your food products. 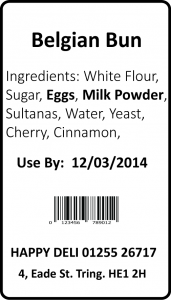 Here at Positive ID Labels we can supply labels to fit the new regulations from December 2014 onwards. These regulations must be met otherwise it can lead to prosecution. Therefore, buying new labels is a MUST!